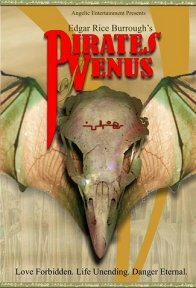 From Windycon, a discussion of early science fiction pulps by Robert Weinberg and Jack McDevitt. Also: The Yodel Song. Props to the Podsafe Music Network. For some the Christmas season begins with the annual Coca Cola festive ad campaign, which can be seen here first. Coca Cola's 2006 Christmas TV advert launches in the UK on 24 November and features a digitally-enhanced Father Christmas. The advert called "The Greatest Gift" features the life of a girl who is gifted a bottle and is directed by Hollywood filmmaker, Kerry Conran, who is repped by Looking Glass Films in Los Angeles. The ad follows a young girl who meets Father Christmas who gives her a small bottle of Coke wrapped in a red bow. Santa repeats his visit at key points throughout her life as the years pass from the 1930s to the present day. Conran's last production was "Sky Captain and The World of Tomorrow." He was also in line to direct Paramount's stalled "John Carter of Mars" production, based on Edgar Rice Burroughs' first novel, the SciFi classic, "A Princess of Mars." have just received word from a Coke rep in Atlanta that the company have brought back their traditional Coca-Cola Santa ads. Tarzan, The Broadway Musical, will be featured on ABC’s “The View” on November 14th. Host Rosie O’Donnell will join star Chester Gregory II and the cast of Tarzan for a performance of the song “Trashin’ the Camp.” Tarzan fans will remember that O’Donnell played the role of “Terk” in the Disney animated film Tarzan. Gregory plays “Terk” in the Broadway production of Tarzan. Tarzan celebrated its 200th performance on Broadway on Wednesday, November 1st. In addition to performances Wednesday at 2:00PM and 8:00PM and Thursday at 8:00PM, Tarzan plays five weekend performances: Friday at 8:00PM, Saturday at 2:00PM and 8:00PM, and Sunday at 1:00 PM and 6:30 PM. * Clark Gable was widely considered for the role of Tarzan in the 1932 Tarzan, the Ape Man, but was deemed too unknown and the role went to Johnny Weissmuller. * This is the first Tarzan film to star Weissmuller, O'Sullivan and Cheetah. * The character of Cheetah was created for this film. He did not appear in the Edgar Rice Burroughs books. * Jane's maiden name was changed from Porter to Parker in the film. * At no point in this, or any other Tarzan movie, is the line "Me Tarzan, you Jane" spoken. * The film used considerable stock footage from Trader Horn (1931) also directed by W.S. Van Dyke. * The word Umgawa was the invention of MGM screenwriter Cyril Hume. * The all-purpose command "Ungawa," could mean "good," "up," "down," "stop" or "go." “Canals were thought to be seen on Mars just after the Suez Canal opened, and Lowell was seeing canals being built throughout the Southwest (he worked in Flagstaff, Ariz.) as it was happening then,” Only a few years after Lowell argued his point, H.G. Wells’ “War of the Worlds” appeared, with its fantastic notion that Martians, living in a world that had dried up, were desperate for water and thus turned their rheumy eyes toward Earth. Playbill.com: What's the marketing plan for Tarzan since the reviews weren't terrific? TS: If you're in the theatre and you watch the show, you're having a great time, and that audience is having a fantastic time. Reviews, historically for us, have not been the indicator of whether a show is going to do well or not. . . . The advantage I have with Tarzan is that there is a connection with the audience, the advance has been very strong, and it has not substantially eroded, which is great. . . . I have a better advance going forward to the end of year on Tarzan than for any of our other shows, other than Mary Poppins. We've shot a commercial that ties into radio, which ties into print [plus an] enormous number of group things. Group scores are really high; groups are a big part of our business. Playbill.com: Are there any plans for a tour of Tarzan? Chantal Janzen will play the role of Jane in the musical Tarzan. Chantal Janzen is currently in the musical Beauty and the Beast in which she plays the role of Belle. Tarzan’s Broadway stars Josh Strickland (Tarzan), Jenn Gambatese (Jane) and Chester Gregory (Terk) paid a visit to Amsterdam last week to help introduce Tarzan in Holland. The actors performed songs from Tarzan at a presentation hosted by Disney Theatrical Productions’ President Thomas Schumacher, who noted the great success of Disney Theatrical’s long relationship with Joop van den Ende and Stage Entertainment. Stage Entertainment's production of Tarzan will open at Holland's Circustheatreon April 15, 2007 -- less than twelve months following the show's opening on Broadway. Tarzan opened on Broadway on May 10, 2006 at the Richard Rodgers Theatre where it has set a new box office record. A third production is expected to follow in Germany in 2008. In addition, members of the Tarzan creative team from both New York and London were in Amsterdam this past week to continue auditions for the Disney Theatrical Productions and Stage Entertainment production of Tarzan. The casting process is underway in Holland, with casting decisions to be announced in the coming months. When Tarzan opens in April, the 100-year old Circustheatre will hold the unique distinction of being the only venue in the world to host productions of all of Disney's Broadway productions to date --Elton John and Tim Rice's Aida played for eighteen months from October 2001 to April 2003 and was followed by The Lion King's record-smashing 28-month engagement. Stage Entertainment's Dutch-language tour of Beauty and the Beast is currently playing there through the end of the year. The summer has brought many triumphs for our beloved Tarzan. We broke the Richard Rodgers Theatre box office record in July and then went on to break our own record two more times throughout the course of the summer. We now are preparing for our holiday marketing campaign where we will launch our new television commercial. We hired a fantastic director, Gregor Nicholas, from New Zealand to direct the commercial. Prior to our commercial Gregor had directed commercials for many well known companies such as Nike. You will find that the piece is athletic, handsome, and sharp. Other efforts of interest include Weekend TODAY on NBC airing a new piece on the show that highlighted Phil's participation and work. The Laughing Place Magazine also featured the show on their cover in addition to a fantastic article. Plans are still being made for the Holland and German productions of Tarzan as well. Tom will be travelling to Amsterdam in October to promote the show and introduce it to their market. Rehearsal for Amsterdam will begin in January of 2007 with an opening set for April 15th -- just shy of our one year anniversary on Broadway. Read the entire letter at the ERBzine.com/disney site. The first full-length biography of the beloved Irish actress Maureen O’Sullivan will be published this fall by author David Fury, who has also written biographies of Burt Lancaster, Chuck Connors, and Johnny Weissmuller, Maureen’s jungle mate in six Tarzan pictures. "Kantos Kan led me to one of these gorgeous eating places where we were served entirely by mechanical apparatus. No hand touched the food from the time it entered the building in its raw state until it emerged hot and delicious upon the tables before the guests, in response to the touching of tiny buttons to indicate their desires." "When the Georgian Party appealed to Moscow, Stalin and Sergo supported Lakoba. Slim and dapper, with twinkling eyes, black hair brushed back, and a hearing aid because he was partially deaf, this player strolled the streets and cafes of his little realm, like a troubador. As the maitre d' of the elite holiday resorts, he knew everyone and was always building Stalin new homes and arranging bouquets for him- just as he is portrayed in Fasil Iskander's Abkhazian novel, Sandro of Chegem. Stalin regarded him as a true ally: 'Me Koba,' he joked, 'you Lakoba'"
If Montefiori is right this quote would have come from the period 1932-34. Koba was a code name of Stalin's. So, it's quite clear that Stalin was onto the MGM Tarzan quite early. On September 12, 2005, the newest member of the Disneyland family of theme parks and resorts opened to the public. Hong Kong Disneyland is located on the island of Lantau, positioned to look out over Penny's Bay and the Chinese Sea. Started as a joint operation between The Walt Disney Company and the Hong Kong SAR government, Hong Kong Disneyland brings the magic of Disney to a whole new environment, respecting the aspects of the culture of the country where it makes its home. The park boasts 2 glamorous hotels, the Disneyland Hotel and Disney's Hollywood Hotel. Prof. Maxon phones a friend. Discussion of the way pastiche and fanfic writers have approached Jane Clayton, Lady Greystoke. Not Many People Know This . . .
“Me Tarzan, you Jane” — Tarzan. This phrase does not appear in any Tarzan film, nor in the book by Edgar Rice Burroughs. Features: Jungle traffic copter. Jim Thompson's take on the "realms" of Burroughs collecting. A slideshow for this talk can be found at Tangor's erblist. Click special features and scroll down to the link. 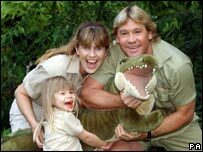 SYDNEY, Australia (CNN) -- Steve Irwin, the TV presenter known as the "Crocodile Hunter," has died after being stung by a stingray in a marine accident off Australia's north coast. Media reports say Irwin was diving in waters off Port Douglas, north of Cairns, when the incident happened on Monday morning. Irwin, 44 was killed by a stingray barb that went through his chest, according to Cairns police sources. Irwin was filming an underwater documentary at the time. Mr Irwin's manager John Stainton told the BBC the stingray's barb had pierced the personality's heart. "He came over the top of a stingray and a barb, the stingray's barb went up and put a hole into his heart," he said. "We got him back within a couple of minutes to Croc 1, which is Steve's research vessel, and by 12 o'clock when the emergency crew arrived they pronounced him dead." The incident happened at Batt Reef, off Port Douglas. whose cast includes Brandon native, Robin Hillman, is one of three television programs created by Winnipeg's Frantic Films nominated for Gemini Awards. These nominations are a first for the company, which specializes in live action performance shows, like Pioneer Quest, Klondike: The Quest for Gold and Quest for the Sea, as well as special effects. The company has also been lauded for its special effects work in blockbuster movies like Catwoman, Scooby 2, Paycheck, X-Men 2, Storm of the Century, Superman Returns and others. The Gemini Awards will be televised November 4, on Global Television. Following a successful two and a half year run, the Disney Theatrical and Stage Entertainment award-winning production of The Lion King ended its run at The Circustheatre, on August 27, 2006 after playing 950 performances. The show opened to rave reviews on May 4, 2004 in Scheveningen, a seaside city just outside The Hague, The Netherlands. In addition, Dutch productions of Beauty and the Beast and Tarzan are on the way. The Dutch-language production entertained nearly 1.7 million people in two and a half years, which represents 12% of the entire population of the country. As previously announced, Stage Entertainment will present the European premiere of Tarzan: The Broadway Musical at the Circustheatre on April 15, 2007.
with a formal dedication of the Bob Hyde Collection, and an exhibition of his ERB highlights. A number of offers for 2008 have come in and the Board will meet later to make a decision on this. Paramount Pictures have not renewed their option with ERB, Inc.
on the John Carter of Mars film project. Paramount have recently gone through many major and somewhat baffling shake-ups. Numerous other film companyies have long been interested in the JC property and ERB fans can look forward to ongoing and exciting new developments. Cheetah's "Pick of the Week"
Tarzan the Broadway Musical Cast Album climbs to top of charts. See the Disney site for previews.